Subsequent to the dramatic decline of critically endangered vultures caused by diclofenac, Nepal is leading in-situ conservation of vultures in South Asia through innovative approaches, such as the declaration of community-managed Vulture Safe Zones. 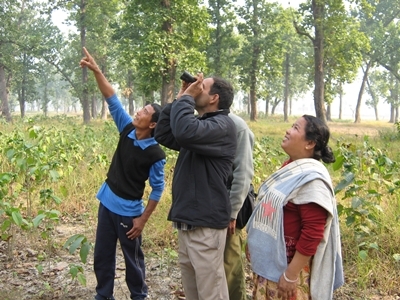 This landscape level approach targets the provision of safe food for vulture colonies across their range in Nepal. The project aims to contribute to the goals of the Government of Nepal’s Vulture Conservation Action Plan (2009-2013) and the Saving Asia's Vulture from Extinction (SAVE) consortium’s manifesto for vulture conservation in South Asia. We aim to do so by examining the illegal importation and use of diclofenac (and other non-steroidal anti-inflammatory drugs), minimizing their use, and reducing human disturbance to nesting areas through community based approaches. We will work in four districts of the western lowlands of Nepal, where major nesting colonies of white-backed vulture (Gyps bengalensis) reside and seven other species of vulture forage. An essential part of our work is to involve community groups, veterinary practitioners and government departments in conservation action to ensure the long-term sustainability of these initiatives.